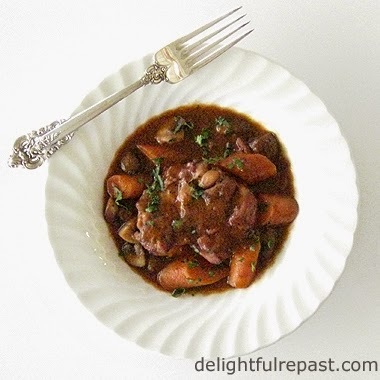 Coq au Vin - Chicken in Red Wine - is one of those "oven things" I like to cook during fall and winter. But since today is the tenth anniversary of the death of Julia Child, who made the dish so popular with Americans, I made it, at the height of summer, in her honor. When I went out to the shops yesterday, there were not any organic bone-in skin-on chicken thighs or whole legs to be found. Not feeling up to cutting up a whole chicken, I decided to try it with the organic boneless skinless thighs that were available. I also could not get my hands on any fresh or frozen pearl onions, so I had lots of modifications to make. So this is not Julia's recipe, though I was inspired by her. I met and chatted with Julia on several occasions years ago, and I know she'd be the first to tell me to just go for it. Turns out I like it even more with the boneless skinless chicken thighs! Oh and I don't flame the brandy. I have cabinets and other flammable things too close to the stove to be messing about with fire! How about you? 1 Cut bacon slices crosswise into 1/4-inch-wide pieces. In a 4- to 5 1/2-quart enameled cast iron French/Dutch oven, sauté the bacon pieces in 1 tablespoon of the oil over medium heat until lightly browned and crisp. With slotted spoon, remove bacon from pan. Drain off all but a tablespoon of fat and reserve it to use as the recipe proceeds, unless you prefer to use all olive oil. 2 Pat the chicken pieces dry with paper towels, and season with pepper and 1/4 teaspoon of the salt. Brown the chicken in a single layer (might need to do it in two batches), about 10 minutes, using as much of the bacon fat or olive oil as needed. Remove to platter. 3 Preheat oven to 300 degrees. Add chopped onions and sliced carrots to pot. Cook for 5 minutes, until onions are very soft. Sprinkle flour over vegetables. Cook for 2 minutes, working flour into the fat. Whisk in broth. Simmer, stirring frequently, until thickened. Whisk in tomato paste. 4 Add wine, bay leaf, thyme and 1/4 teaspoon salt to pot. Add chicken and bacon back to pot. Over high heat, bring to a boil. Cover with foil and lid and place in oven to cook for 1 1/2 hours at 300 degrees. 5 Take pot from oven; remove bay leaf. If not serving it today, let chicken cool to room temperature in the sauce, up to 2 hours, then cover and refrigerate for 1 to 2 days. 6 On serving day, set pot over medium high heat and bring to simmer. Meanwhile, in 12-inch skillet heat 1 tablespoon each butter and olive oil. Add mushrooms and 1/4 teaspoon each salt and coarsely ground black pepper. Sauté mushrooms over medium high heat for about 5 minutes. Stir in brandy. Add to pot. Cover and simmer for 30 minutes. Uncover, sprinkle with chopped parsley and serve. Excellent! I've been looking for recipes like this one. Full flavor, low carb. Doesn't look too complicated/time consuming either. Can't wait to sink my teeth into this one. Richard, thank you! I hope you and yours will enjoy it as much as we did! I adore Coq au Vin! This looks like an excellent recipe! I can't wait to give it a try. Hard to believe Julia has been gone ten years. This sounds wonderful. Thanks, Michelle! Do let me know how it turns out for you. Mildred, I knooooww! Didn't the last ten years just fly by! Love coq au vin and I only made a quick version before. Yours looks excellent, Jean. Angie, thanks! I know some people eat it with noodles, and boiled parslied potatoes are a classic accompaniment, but for me it's gotta be mashed potatoes every time! Thanks, Sully! I hope you'll try it soon - you just might like the "nuanced approach!" Julia was my idol and role model. I've made Coq au Vin but not tried her recipe. Shame on me. Plus this looks much better than the recipe I tried. More of a stew consistency. Thanks for the reminder to try Julia's version. Lea Ann, let me know how it turns out for you. Julia was just the same in person as on TV - just lovely! This looks delicious! So cool that you met her! Thanks, Bianca! One of the things I really appreciated about Julia was that even when she was the only "celeb" in the room, she acted like we were all on the same level. i couldnt think of a better way to pay homage to julia. i treasure my copies of mastering the art of french cooking but am yet to make her coq au vin... it looks so daunting! definitely inspired now to give the recipe a go. thanks jean! Thalia, thank you. And I hope you'll try it soon. Do tell me how it turns out for you. We love it with mashed potatoes, but noodles would be good, too. Greg, just as she inspired you (and me), think of all the people you are inspiring now at SippitySup.com! Lovely!!! I wached the movie about Julia and Julie. Have you watched it and did you like it? Thea, I loved it! I like Amy Adams' Julie more than I do the real one and, of course, Meryl Streep was fabulous as Julia. Excellent cast! Thanks, Christine! Hope you'll give it a try, it really is delicious! Hi Jean, We all loved Julia, didn't we. Her strength was in making others feel comfortable in her presence, even on TV. And I learned from her the lesson that making mistakes is the heart of learning how to cook. I agree about flaming brandy - could never accept that burning it off was somehow better than stirring it in! Thanks, Doc! I don't know, might be even better if we flamed the brandy. But I just know I'd burn the house down! I made Coq au Vin recently. It truly is amazing!! YUM! Thanks for linking up with #FoodieFridays! Thanks, Christie! Keep up the good work! Yum! This looks so good! I love the richness of flavor the wine adds! 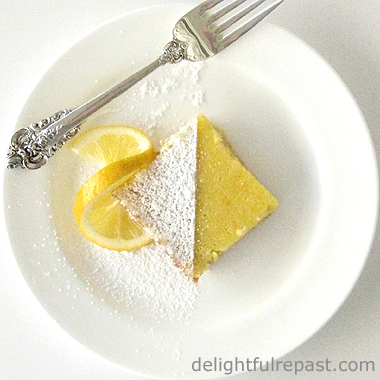 Thanks so much for sharing it with us at Foodie Fridays...I'll definitely be making this one! Hope you had a great weekend! Michelle, thank you! I hope you like it just as much as we do!